The SILJA Shearling jacket in Sky Pink feels like a sunset giving you a big hug. Since we produce each SILJA Shearling Jacket one at a time, we are able to customize the fit just for you. Add to Cart to provide your measurements for a bespoke fit. Shot on location at Iceland's Sólheimajökull glacier by Saga Sig. This icy volcanic outlet was too dramatic not to counter with a pop of pink. "Wearing one color, especially pink, is both irreverent and charming, calling to mind Missy Elliot in the '90s." 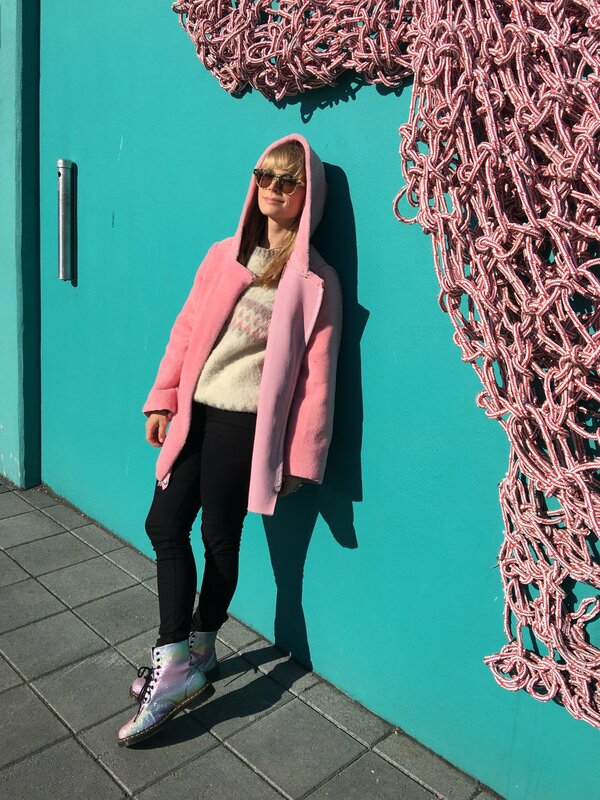 "For a different spin off the glacier, I styled Liv in the shearling in true Nordic style: Icelandic sweater, slouchy fatigues and glittery combat boots." "I liked the look so much I wore it myself once back in Reykjavik with black jeans. The rule here is crystal clear: there are no rules."